I’m just over average height for a man in this country, at 5’10”. When I measure my x-seam I get just under 43″ which is probably pretty average too (population-wide x-seam records are not yet collated by the Office for National Statistics). On paper, the Corsa doesn’t sound that much higher than the Nazca Gaucho on which I rode Paris-Brest-Paris – seat heights of 26.25″ and 23.6″ respectively – but the reality is that the latter has no handling issues at all, with flat shoe to the ground at leisure. I think part of the mystery is the way that stick-framed bikes adjust – by sliding the seat instead of having an extendable boom. In many ways it’s a great solution: your bottom bracket is always perpendicular to the frame, you don’t need a double section of frame – aka the boom – to overlap and clamp down, and you can use a quick-release more easily as you don’t need to worry about the rider’s legs. However, the unfortunate implication is that riders who are very tall end up closer to the ground, while those who aren’t end up higher off the ground – a bit of a vicious circle! Although the Corsa I rode is recommended from 41″ x-seam up, being at the low end compared with the 50″ (!) maximum x-seam meant the seat was forward and high, compounding the issue. There’s also the question of weight distribution – the balance between front and back wheels changes depending on who is riding a stick bike, while the designers of a boom frame can optimise for a relatively fixed position. I know one rider on a small Bacchetta frame who says he finds the weight is too much over the rear wheel for his preference. 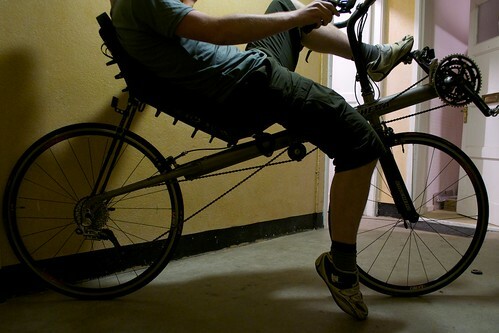 At the end of the day you’re probably going to have to choose one or the other – there’s no way to get a sliding seat on a Euro-style frame (although Carbent’s stick-bikes have a fixed seat, and therefore come with a boom). Just be aware that the seat height as quoted for bikes like the Corsa is very much going to change between a short and a tall rider, and plan to test ride accordingly! Sure you can. 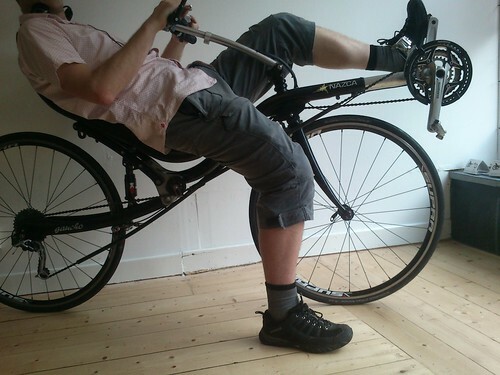 The Azub bikes have a sliding seat (13.5 cm adjustment possible) and an adjustable boom in addition to that. You can use the sliding seat to set the weight distribution as you want it, or to fit different riders without having to change chain length. You don’t get the benefits of a fixed boom, though. Aha! Good spot. I’m not at all familiar with the Azub line – so they combine the moving seat and boom? That’s what I call adjustable! the Haiku by EDGE would fit in very well if it is still made ..